The draft pilot MSP Plan for the Southern Middle Bank area is generally of strategic nature. It is a tool for balancing the different interests of sea space use. It is a structure plan, because it diagnoses the spatial conditions of development, determines components of the spatial system and their relationships/interactions and indicates their desired “shape”. In principle, the draft pilot mariti me spatial plan awards priority for some uses, and ensures cohesion of the whole system of proposed solutions. Limitations in sea space usage are introduced, only in a few cases, and only with the objective of assuring the above mentioned cohesion. The pilot plan was developed in the framework of the BaltSeaPlan project aiming at (among others) preparation of the various pilot plans to test planning methodology and readiness of the Baltic Sea Region countries to start planning. The exercise of preparation of the Middle Bank pilot plan aimed at testing and development methodology for cross-border planning in EEZ. The pilot plan is thus written in English and Polish. As a pilot MSP plan, it is not legally binding. The plan aimed at supporting the preparedness of Polish and Swedish authorities for introduction of the MSP in general in both countries and in particular with regard to cross-border planning aspects. Preparation of Middle Bank plan was funded within the framework of the Baltic Sea Region Programme 2007-2013 and was cofounded by the EU. The BaltSeaPlan project duration was 2009-2012. 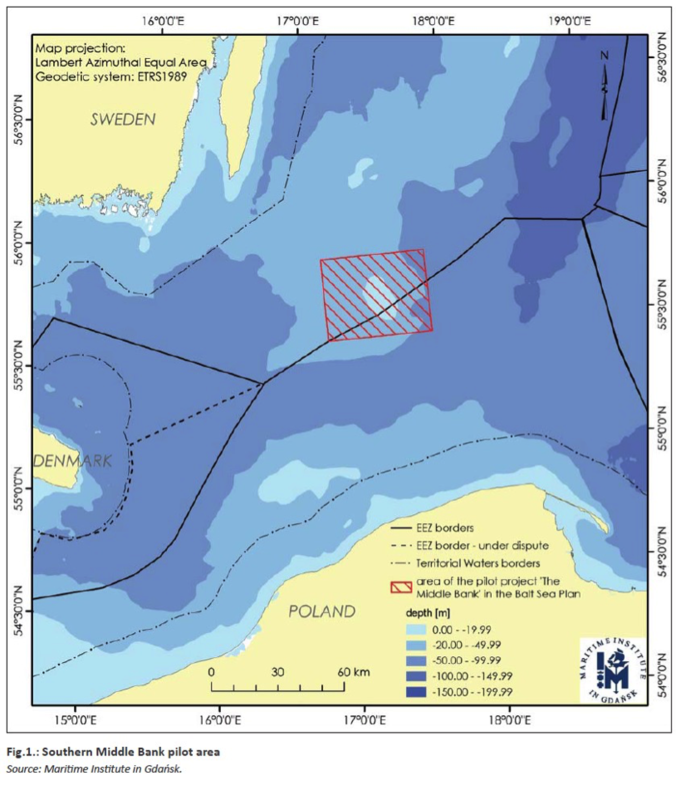 BaltSeaPlan project accompanied the EU Maritime Policy by supporting the introduction of Integrated Maritime Spatial Planning and preparation of National Maritime Strategies within Baltic Sea Region. The Middle Bank has been launched with ambition to examine possibility of cross-border maritime spatial planning and to test and develop methodology for planning EEZ in a cross-border setup. formulation of general recommendations and requirements for orderly use of the entire sea space planned. The debate with stakeholders have been considered as a crucial element of the planning process. In Poland almost 100 potential stakeholders have been identified. They were asked to present their interests in the planned area. Written replies came from 29 stakeholders, describing their plans for using the planned area in the future. Two meetings with stakeholders were organised. The first one was attended by 58 persons and focused on explaining the need to prepare such a plan, presenting the main ideas of the draft pilot maritime spatial plan and discussing the results of the written consultations. During the second meeting proposed provisions of the draft pilot maritime spatial plan and remarks sent in advance by stakeholders were discussed. The draft pilot maritime spatial plan was published two weeks before the second meeting on the web pages of the Maritime Administration and of the Maritime Institute. At this stage the attention has been paid to conflict mitigation and conflict resolution. Discussions with the stakeholders have allowed to formulate final provisions of the draft pilot plan. Consultations with Swedish stakeholders were of limited (focused) nature, among others due to lack, at that time, of relevant authorities responsible for MSP in the EEZ in Sweden. Transboundary issues were considered in relation to commonly accepted methodologies for the development of the plan. Some innovative planning solutions taking into consideration a cross-border specificity of the plan were also developed. 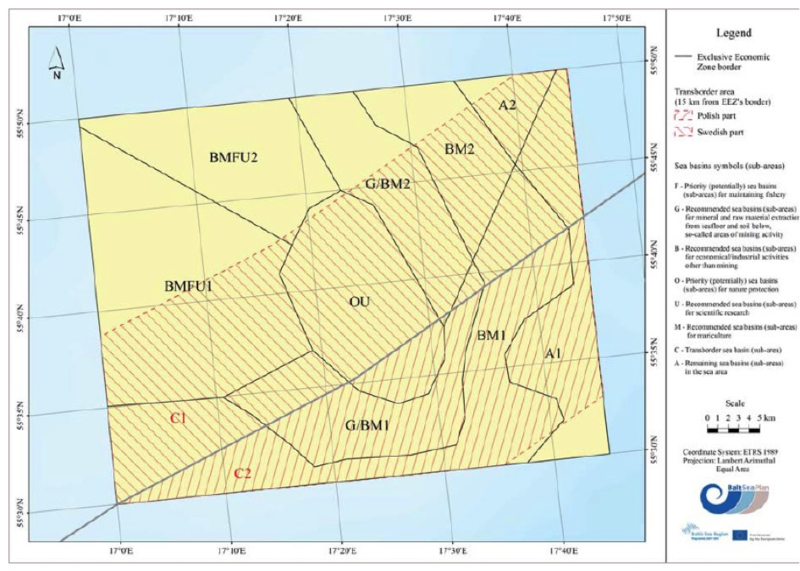 For instance so called transboundary sea basin (sub-area) (of 15 km width on both sides of the EEZs’ border) was established for management purposes. 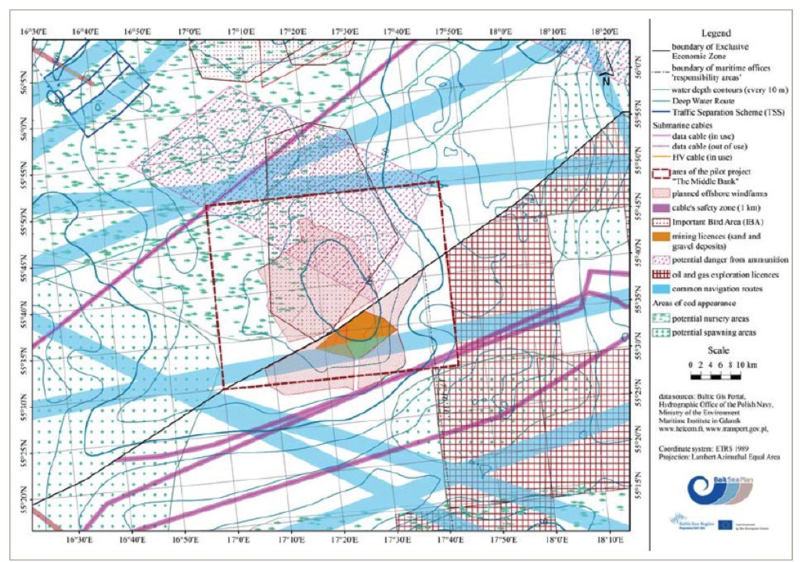 In this zone cross-border consultation shall be carried out on the basis of environmental impact assessment documentation (in accordance with the requirements of the Espoo Convention) for building structures, artificial islands, laying of installations and mining activities, with the exception of mining and transferring liquid hydrocarbons, in case of which transboundary consultation is required in the whole area of the Plan. The work on development of the methodology for transboundary consultations have been continued in the framework of the PartiSeaPate project and Baltic Scope project. The Middle Bank experience served as a starting point there.